From the hawthorn trees comes the sparkling sound of thrush and finch chatter. All around the landscape is weighed down by weeks of rain, the sodden grey and blackness, but this conversation lightens the scene. A flock of goldfinch burst into the sky, skipping through the air in their piecemeal flock. Their yellow wingbars flash against black feathers like miniature human warning signs. I train my binoculars on the thorns and see a redwing sat in the branches, contributing to the bird discussion. As I step towards them it ends instantly and so I turn and take a path to leave them. The stumps of ash trees glow resinous on the hillside, the felled trunks lie supine beside them, the bark darkened by rain, the green and blue lichens thrive without a care for the tree’s demise. The brash has been piled and burned in elevated corrugated iron beds, and to many people this would seem like a careless act of deforestation. But it’s not. Farthing Downs sits on a bed of chalk and is home to a vast array of wildlflowers which are disappearing from the English countryside. The City of London Corporation are here engaging in a battle of restoration. 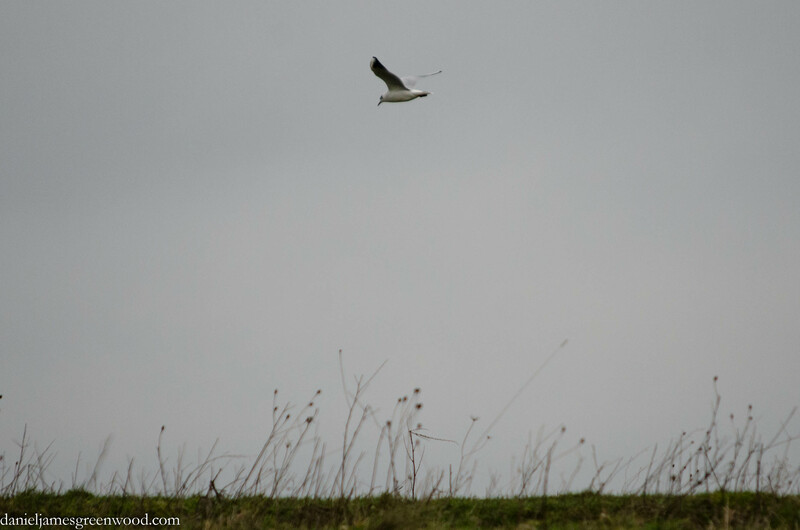 Further along the path a black-headed gull skates low over the lane – I’ve not seen them so close to the grasslands here – propelling itself up and into the wind. Its relationship to winds so cold and blustery seem uneasy, and against this vista of meadows and woods, all the more unique. A fine photo paired with descriptive writing. Thank you for your encouragement, Mary.